The city of San Jose stands in the state of California and is the capital of Silicon Valley, boasting some impressive statistics. San Jose is one of California's fastest-growing cities, the largest city in northern California, one of America's safest cities and San Jose averages over 300 days of sunshine each year. 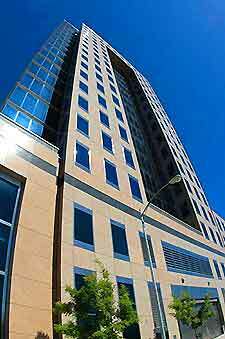 Just 45 minutes drive from nearby San Francisco, San Jose is often referred to as the 'Gateway to the Bays'. Founded in 1777, San Jose was California's first capital city and is full of truly world-class tourist attractions, fine dining and a vibrant nightlife. San Jose is an impressive, dynamic city and is home to many of America's top manufacturing companies and industry leaders. Where to stay in San Jose depends very much on your requirements, but you can be sure that there are plenty of hotels to choose from. Located throughout downtown San Jose, many of the city's hotels are close to the San Jose McEnry Convention Center, offering great views of the city and its parks. Cheaper bed and breakfast options are less commonplace, although there are a number of guesthouses in San Jose, and also in nearby Saratoga and Los Gatos areas. 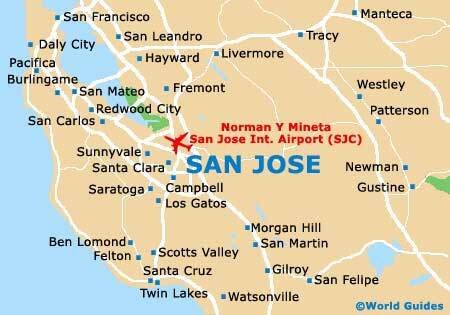 Further hotels are close to San Jose Airport (SJC), which is just a few minutes drive from the city center. 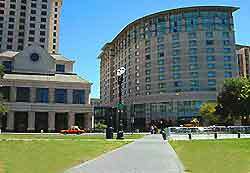 More information about San Jose Hotels. Tourism in San Jose is becoming an increasingly important part of life and the main tourist information center in the city is the San Jose Convention and Visitors' Bureau on Almaden Boulevard. Providing a host of the latest information about where to stay, where to visit and what tourist attractions are must-sees, other information on offer includes things to do in the Burbank district, Almaden Valley, Japantown and Rose Garden areas. San Jose has a host of popular tourist attractions, including Happy Hollow Park and Zoo - standing in Kelly Park, with numerous rides, family attractions, amusements and exotic animals; Monopoly in the Park - the world's largest Monopoly board, located in San Jose's scenic Guadalupe River Park; Rosicrucian Egyptian Museum and Planetarium - containing a large display of mummies, jewelry, historic artifacts, Egypt information and an authentic tomb; and Winchester Mystery House - an enormous and surprising mansion, with 160 rooms and many weird and wonderful features. Other tourist attractions in San Jose include Fallon House - an early Victorian mansion, built by the seventh mayor of San Jose; the Sikh Gurdwara - a colorful and eye-catching building, featuring a series of large domes; San Jose State University (SJSU) - a vast and impressive complex, with many notable buildings and historic structures; New City Hall - a striking modern building, opened at the end of 2005; and numerous parklands and gardens, such as San Jose's Almaden Lake Park, Alum Rock Park, Guadalupe River Park, Kelley Park and Lake Cunningham Park. More information about San Jose Tourist Attractions and San Jose Landmarks. Some of the most popular museums and art galleries in San Jose include the Children's Discovery Museum of San Jose - full of hands-on activities combined with exciting displays; the History San Jose Museum - with historic information about San Jose's rich heritage; the Tech Museum of Innovation - featuring an IMAX theater, virtual rides and even a Jet Pack Simulator; the San Jose Museum of Art - a major art gallery with a huge permanent collection of modern art; and the San Jose Institute of Contemporary Art - known for its high quality art exhibitions and interesting, educational programs. 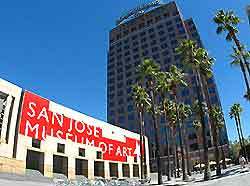 More information about San Jose Museums and San Jose Art Galleries. Tourist attractions located near to San Jose include the Ano Nuevo State Reserve - to the southwest of San Jose, famous for its enormous elephant seals; the Bargetto Winery - producing many award-winning wines, with regular guided tours and wine tastings; Paramount's Great America in nearby Santa Clara - a vast theme park, with fast rides, rollercoasters and fun for all the family; the Mission Santa Clara de Asis - standing in the center of Santa Clara's impressive university campus, nearby San Jose; Pescerado - a scenic and charming town close to the coast, located to the west of San Jose; and the nearby coast - with many historic coastal towns, located to the west and northwest of central San Jose. More information about San Jose Attractions Nearby.